What is New with Sprint? | A Savings WOW! Recently, I was invited to attend the Sprint Chicago Regional Event at Sprint’s Chicago office. I was very curious to see and hear about what they are doing now because many years ago, I had friends who were unhappy with their service. What I learned is that they are undergoing network changes and device updates to make sure that their customers are getting the best service. Besides building new cell towers, they are also making improvements to their existing ones. They have a lot of coverage in the Chicago-area and are constantly looking for ways to make it even better. Their services even include Sprint’s Direct 2 You with free delivery of your phone to you (at home, at work, at your child’s soccer game) – what a great time-saver. Having six people in our home that rely a lot on technology, what really interested me the most during the event was the variety of prepaid plans. The one I think may work well for my family is the Virgin Data Done Right package that is exclusively available at Walmart. With that package, you receive a smartphone, plus an unlimited talk, text, and data plan with no contract needed. You pay as you go. 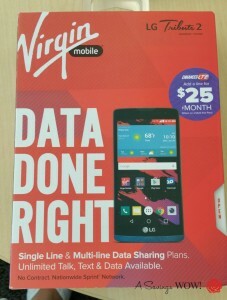 The biggest perk is that you can purchase additional Virgin Data Done Right packages and link up your accounts. Unlike other “family plans” out there, with this one, you have a primary account holder that controls the data plan. Instead of needing to buy a separate data plan per phone, you can purchase a plan for the entire group of phones and divide up the plan accordingly. For example, if you have your kids on the plan and you are the primary account holder, you control how much data they can use. You can use this as a reward or chore earning system where they can earn more data as they complete chores or exhibit good behavior. You can also use it if they are not behaving as they should by decreasing the amount of data they can use (possibly to zero if needed). Since you do this all through an app, it should be easy to make these adjustments as needed. Imagine having that power! At the end of the event, we were each given an LG G4 smartphone with Sprint service. 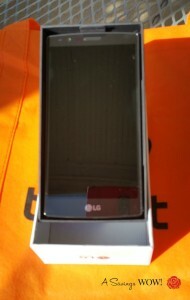 It is a sleek looking phone with a leather backing. The screen is very bright and easy to view. The camera takes excellent quality photos. It is the first smartphone from Sprint with a total of 24 megapixels of crisp photo clarity – a 16MP rear-facing camera and an 8MP front-facing selfie camera. The LG G4 also comes pre-loaded with the latest Android software – Lollipop 5.1. It really is loaded with many features that make it an impressive phone. My kids have watched videos and played games on it. The call quality and texting capability is great. You should consider it for your next phone. To find out more about the products and services Sprint has to offer, visit Sprint’s website, Facebook page, and Twitter account. 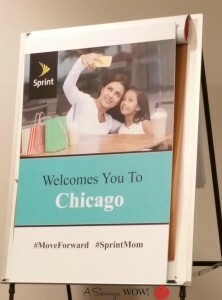 Follow the hashtags #MoveForward, #SprintMom, and #Sprint4Chi to read about my fellow bloggers’ experience at this Sprint Regional Event. To keep up with the #SprintMom conversation on social media, visit Sprint Mom.